Most of your closest friends are engaged or already married. When you got engaged you all were excited to experience wedding planning together - share tips and vendor recommendations and even commiserate when it got stressful and overwhelming. But, planning your destination wedding will be a different experience than your friends are going through. Their tips, while helpful, won’t always be relevant to your experience. 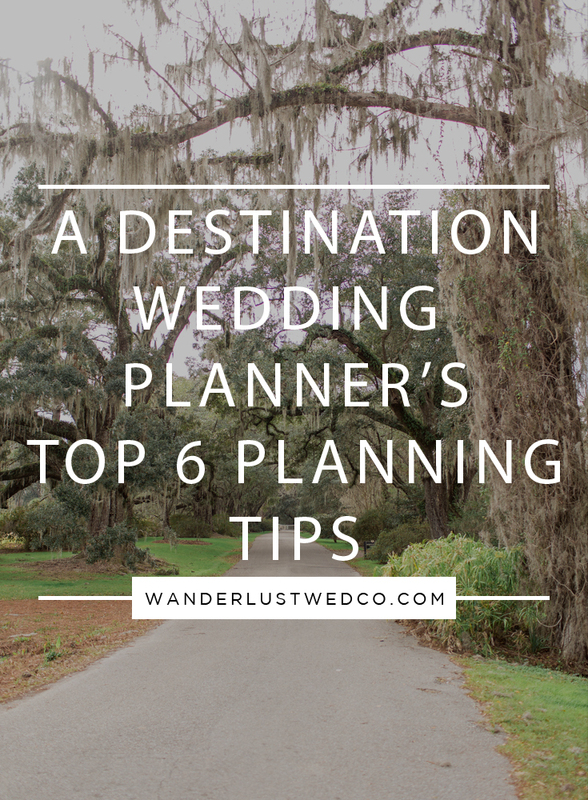 But, as your destination wedding planners, we have the top six tips you’ll need to remember while planning your destination wedding. Allow yourself ample time to plan. With time zone differences and being thousands of miles away, planning your destination wedding will take time. Allow yourself plenty of time to do research on the area, make a trip or two prior to the wedding day and recognize that even the simplest task - like making a payment - can take longer due to time zone and currency differences. Trying to plan it all in a short amount of time will only make it more stressful for you. Make sure someone scouts the location first. Whether you visit the location in person during one of your pre wedding planning trips or you have us do it for you, you’ll want to be sure someone scouts the location first. This will ensure you have a good understanding of the layout and needs of the environment to create a better overall experience for vendors and guests. Keep expectations in check. Local customs and traditions will vary by location and are often very different than you’re used to at home. While these customs and traditions make for a unique and memorable wedding experience, they can often contrast expectations for how the planning experience and wedding weekend will go. Keep expectations in check by doing research and allowing our experience to guide you through the process. Use local vendors when possible. Using local vendors not only creates a more authentic experience for you and your guests but it also allows you to support the community you’re visiting. In addition to that, using local vendors can save you money since you won’t have to budget for vendor travel fees. Be flexible. Just like with any wedding, not everything will go according to plan. But, a destination wedding will require adjustments throughout planning to accommodate for local customs and availability of products. Be flexible and don’t let minor setbacks or inconveniences influence your overall experience. Be grateful. You’re loved ones are traveling a great distance to celebrate with you and it will be an experience none will ever forget. Be grateful for their love, support and willingness to travel anywhere in the world to be there for you on your wedding day.